Worried about what's in your conventional deodorant? Truly's Natural Deodorant contains only organic coconut oil, sugar, cornstarch, baking soda, and beeswax. --It's ALL natural! So now that we know it's safe, you're wondering if it's effective, right? Read on to learn about my experience using Truly's Natural Deodorant and to learn more about this product itself! First, how do the ingredients in Truly's work? Sugar is a natural way to kill bacteria. 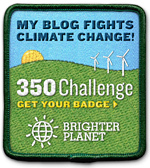 (Bacteria is what makes your armpits stink.) Baking Soda also works as an odor fighter. Coconut oil is antibacterial and anti-fungal, all while being incredibly moisturizing! Beeswax is good for the skin and holds all the other ingredients together. I have been using a main-stream deo (the brand with the white bird) and have been pretty happy with it during the day, but when I come home and smell the arm holes of my shirts, they smell like BO. So obviously I was not getting 100% protection from my "typical" deodorant. I've been wanting to switch to something more natural, but was honestly skeptical about how well it would work. To begin my Truly's Trial, I showered, shaved, washed, and switched to Truly's Natural Deodorant. It's been 10 days, and Truly and I are still going strong. The deodorant is easy enough to scoop out of the tub with my finger (and not my fingernail) and it gets easier to get out as the weather warms up. I use about two pea-size scoops per armpit and just rub it on in the mornings. (The picture shows one pea-sized scoop.) The natural deodorant is very silky and can seem a little greasy for a moment. I just keep rubbing it in and the greasiness goes away. I was initially worried about getting grease marks on my clothes, but this has not been a problem at all, even on hot days! One of the first things I noticed when putting it on was that it smelled delicious...maybe even too delicious! It smells just like an Almond Joy candy bar to me. (So I had to laugh when I saw Truly's banner about eating the deodorant! That's why I chose it for the top of my post.) Luckily I had no one mention the fact that I smell like a giant delicious candy bar. The strong scent essentially goes away after application. I do want to mention that, from time to time, I have felt some stinging in my armpits. I assume it's from the deodorant, although I can't imagine why that would be the case, since I'm not allergic to any of the ingredients. This only happens on occasion, so I figure it's just my skin adjusting. If it gets worse, I will discontinue use of the product. If it stays the same, I am planning on finishing the tub of deodorant because I like it very much otherwise. Wearing the natural deodorant: During the day I felt secure. I didn't stink up my office, even on a hot day. I rode in a sedan with four other women and knew that I smelled fresh. After returning home, the arm-holes of my clothes do NOT stink like sweat at all. 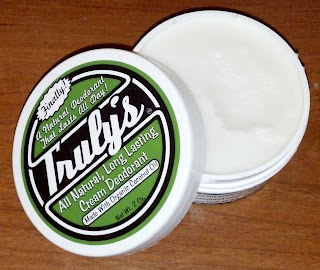 I've been really impressed with the stink-banishing abilities of Truly's Natural Deodorants!! So now you know that there is a natural deodorant that works! It's Truly's and it comes in a tub. All the initial fears that I had about the product were unfounded. It truly blocks odors. It doesn't leave grease marks on my clothes. It is not annoying to put on with my finger. No one said I smelled like a candy bar. I didn't stink at all or sweat profusely. Overall, two pits up! Thanks for reading my Truly's Natural Deodorant Review! !